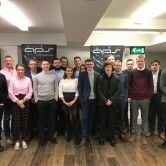 APS mantra ‘from concept to design’ is just one reason why we are proud to continue to sponsor events for up-and-coming architects in conjunction with Ulster University. Just before Christmas 2018 an event took place at the Mac Belfast where final Year Architectural Technology and Management students presented major project designs they are working on to guests and lecturers. The day included an inspirational talk from Richland Group CEO Gary McCausland. The students are a highly competent group and we wish them well as they approach the final stages of their course. 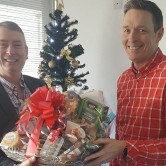 Congratulations to the winners of our Christmas hamper competition, Peter Stewart from Calico Architects seen here being presented with it by APS Contracts Manager Kenny Faulkner and Jonathon Gannon from Todds Architects. Anthony Crawford seen receiving the prize from Kenny on Jonathon’s behalf. Thanks to all who took part! APS are pleased to have made 2 charity donations last month thanks to the efforts of our colleagues Robert Bell and John Hilland who took part in the annual Movember moustache growing activities. Between them they raised over £1000 and APS matched their total. Chosen charities are the Children’s NI Hospice £1500 and the Movember Foundation for men’s cancer and men’s suicide prevention £552. Well done guys! All the hard work certainly paid off as the End of Year Show event at Ulster University School of Architecture was hailed as a resounding success by the record number in attendance. The work on show was produced to an exceptionally high standard and was praised by Eddie Weir (CIAT Vice-President Practice and NI Regional Chairman). It was also the view of several professionals attending the ICAT (International Congress of Architectural Technology) from all over the world. The students demonstrated their design capabilities, understanding of BIM processes and use of BIM authoring tools, and high levels of technical competence. International guest speakers were the pinnacle and only added to what was a great evening. APS is proud to be closely associated with Ulster of University School of Architecture with programme sponsorship, student façade consultancy with our Contracts Manager Kenny Faulkner and also providing guest lectures through the year. APS presents their annual award for best in “Design Creativity in the BIM module”. This year’s winner was a well-deserved Matthew Dawson, seen here receiving his award and cheque from our Kenny Faulkner. Kenny Faulkner also seen here with Dr. Noha Saleeb, Associate Professor in Creative Technology and Construction PhD, Msc, BArch(hons), FHEA, MCIAT in Middlesex University, London who presented her paper and presentation on Non-geometric Data Veracity at Project Hand-Over for BIM Data Management. Last month saw the retirement of a longstanding and trusted business partner of APS, Duraflex Sales Director Ian Cowan pictured with APS Director Chris duBoulay. APS have benefitted from Ian’s wealth of pvc-u window industry knowledge and business background since our company was formed in 2001. We will sincerely miss Ian’s input into our company. We will miss his regular visits from Duraflex headquarters in Tewkesbury to our Lisburn Sales office. We wish Ian a brilliantly relaxing time from now on and thanks once again for many years of supporting APS.